Are you ready to help with the next great event? Click on the Info sheet download file to your left to find out how. 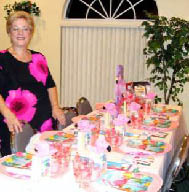 We started in 2004 at Weeki Wachee Senior Center with a small boutique and 13 tables decorated in themes with hand-painted centerpieces and items. We began not knowing who would come or if it would be a bust. Well it surprised us all and we have been having a blast every other year since then. The more you participate, the more fun it is. There are lots of ways to participate. 4. paint items for the boutique, transforming yard sale finds or something new. We really need lots of items. 8. 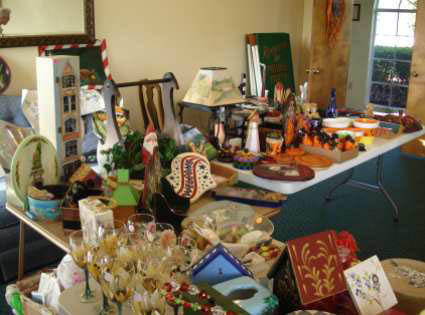 ALL OF THE ABOVE If you have never made it to a Tables and Treasures event Please try to make it this year. Ask other members and they will tell you all about it. We have not set a date yet, but it will be in the fall, hopefully Saturday, October 27. We are scouting out new places and have lots of ideas. Please think of ways you can participate and make this the best year ever. 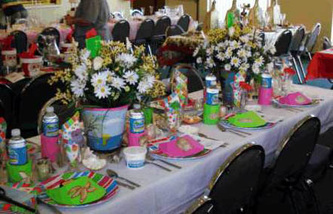 Below are pictures of some earlier events. Please Click on the pictures for more information. And keep checking back for more information!